Group photo of the Aurigid MAC research team at NASA Ames. If you,too, have pictures of the September 1 shower, please let us know. Theevent was caused by the fortuitous collision of Earth with theever-wandering dust trail of comet C/1911 N1 (Kiess), a potential Earthimpactor and a source of debris that might harm satellites in orbit. In otheryears, that stream of dust particles passes by undetected, just outside orinside Earth's orbit, but in 1935, 1986, and 1994 the stream wandered intoEarth's path and created a brief shower of bright meteors. The showerwas seen by only two observers in 1994 and one observer in 1986. Thanks to thepower of foresight, this year thousands were able to enjoy the spectacle. "Thiswas my daughter's (age 9) first shower and she and her friend were absolutelydelighted, asking: 'When's the next one?' Hopefully we have a new astronomer inthe making!" wroteDoug Blasco of California, one of many people who witnessed the meteoroutburst. This is thefirst time that the encounter with the dust trail of a long-period comet hasbeen predictedthrough modeling. Each meteor was a small time capsule from the year 4 A.D.,give or take 40 years, when the comet rounded the sun. Comet and dust moved ina 2000-year orbit far beyond Neptune, all the way into the Oort cloud, beforefalling back again. The comet returned in 1911 and was discovered by then LickObservatory post-doc Carl Kiess. The dust took longer to return, pushed into awider orbit by solar radiation, and has been coming back ever since in a continuous,but very thin, stream of dust. Aspredicted, Earth washosed by that dust in the early morning of September 1, 2007, when, duringa short period of time, meteors radiated from the constellation of Auriga, theCharioteer. The shower was seen in most states west of the Mississippi,including Hawaii and Alaska, and from the western provinces of Canada. Some eyewitnesses watched the shower in a jacuzzi, or from their bedroom window.Each observed between a handful and several tens of bright and colorfulmeteors, some with flares and brief trains. More than a hundred observers wroteus about their experiences and so far 53 contributed images of the Aurigids,captured with digital cameras. Some of the images are quite spectacular, alsobecause the 4-day past full moon nicely lit the landscape that framed thebright meteors in the sky. Daytimeobservers in Europe, the eastern USA, and Brazil detected the presence of theshower from reflected radio signals while listening for distant radio stations.The shower was very obvious, because there were many long-lasting overdenseechoes during a 1.5-hour period. 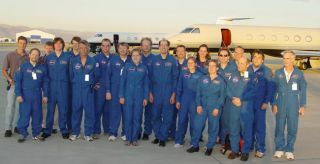 Earlierthat night, an international team of 24 researchers had departed in two Gulfstream V aircraft from NASAAmes at Moffett Field, a little nervous about whether the predictions wouldhold. But as soon as the planes climbed into the sky, the first Aurigids wereseen and rates continued to climb during the night. As the shower peaked, therewere enthusiastic cries whenever another meteor spectrum was recorded. ? Theairborne observers measured meteor rates and magnitudes, and collectedspectroscopic data with a wide variety of instruments. They were able to monitora large surface area near the horizon, where extinction is low at 47,000 feet.Each observer saw around 120 Aurigids during the outburst in a 40 x 30 degreefield of view. Results of our counts were called down and were immediatelyposted on our mission website, to the delight of those clouded out or living inparts of the world where the shower could not be seen. The showerpeaked at 04:15 +/- 5 minutes PDT, earlier than our predicted 04:36 PDT +/- 20minutes, reported in the August 7 issue of EOS, Transactions of the AGU. At the peak, meteors were detectedat a Zenith Hourly Rate of about 100/hr, better than the August Perseids, andwithin a factor of two from the anticipated rate. The details of the showerprofile and particle size distribution will help improve our prediction model. CometKiess, on account of being in a long-period orbit, has returned from the Oortcloud relatively recently. Whether or not some of the meteors may have been causedby the remains of a proposed primordial comet crust awaits a further analysisof the many meteor trajectories and spectra that were recorded by airborne andground-based observers. The AurigidMulti-Instrument Aircraft Campaign (Aurigid MAC) was the first deployment ofthe two Gulfstream V aircraft in a research mission. We received tremendoussupport, and thank all that made this mission possible. Sadly for Doug'sdaughter, the Aurigid shower will not return in her lifetime, but there will beother opportunities to study unusual meteor showers. At which time, we all hopeto do this again.